Some call it “KLEM-a-tis,” others say “klem-AT-is,” but no matter how it is pronounced, clematis are spectacular blooming vines that are gorgeous on trellises, arbors, fences and gazebos. They also love to climb trees and shrubs. 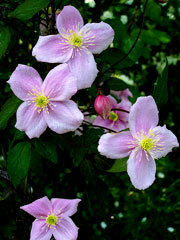 Depending on the variety, clematis vines come in various combinations of purple, pink or white flowers. Some begin blooming in early spring, others bloom throughout summer. Once established, the “queen of climbers” is an easy-care, fast-growing beauty that can reach up to 12 feet long. Be sure the vines are securely entwined or tied securely to the trellis, arbor, fence, etc. so they can withstand heavy winds and/or snow. Make sure its roots are kept cool, water regularly, especially during dry seasons, and fertilize regularly with general purpose fertilizer. 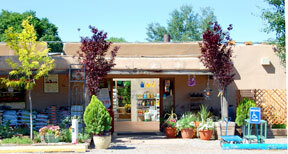 Prune in late winter/early spring to control size and shape or to encourage more profuse blooming. Dead or damaged stems may be removed at any time.